Also met a celebrity of some kind - anybody knows, who he is? Enough for now - another report will follow next year! I'm 54 years old and live in Sevilla, Spain. Left Denmark in October 2009 to join up with my cheerleader Esperanza (see above) and her 2 sons. Still work for my Danish company - a big hospital just outside Copenhagen in the computer department. I'm not a programmer and not a technician either! Give me a screwdriver, and I can ruin almost anything! My responsibilities are handling of incidents and service request in the IT-environment - and to act as project manager in all possible kind of projects - small and big. In my spare time I like to play badminton, OTB-chess (FIDE 2167) and I also read a lot (mostly detective novels and about history). Am also very interested in all kind of sports - I attend all home games of my favourite soccer club FC Copenhagen. How did I get into the NFL? Well ICCF is to blame for that! In my first correspondence chess tournament WT/III/132 - all the way back in 1974-76 - I was lucky to meet an opponent from the US Eugene Robbins, Euclid Ave in Dravosburg (suburb to Pittsburgh). Very quickly we switched from postcards to loooong letters - and in 1998 he invited me to visit him in his mobile home! 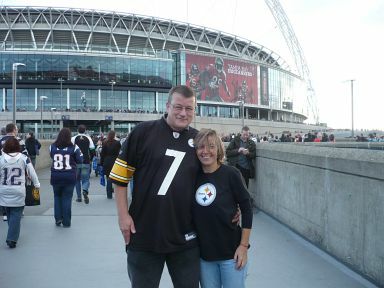 And, here it comes: On my 22nd birthday (August 5th 1978) he took me to Three Rivers Stadium for a NFL preseason game Falcons@Steelers. The action on the field got me immediately - hey I did not even know the sport existed…..
Back home in DEN I missed the NFL a lot! Nothing in the newspapers (not even results) and nothing on TV! 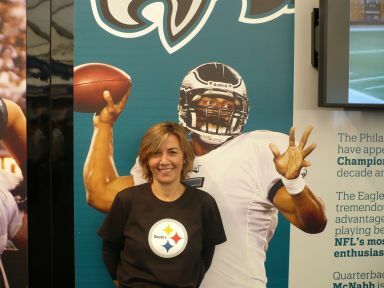 Luckily about a decade later somebody invented the Internet - and then I started to learn and read everything about the Steelers. 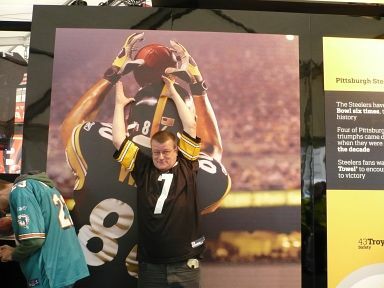 And to my big surprise (and joy) I realized, that I had actually seen the winners of SuperBowl XIII. 10 years ago Danish TV suddenly started to show NFL-games. 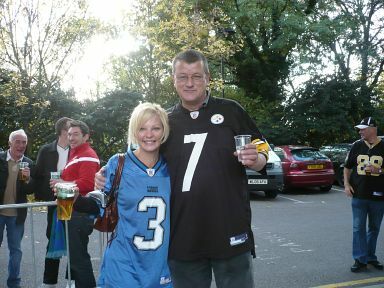 The first couple of years only the SuperBowl - but the last 5 years I have been able to watch NFL every Sunday! 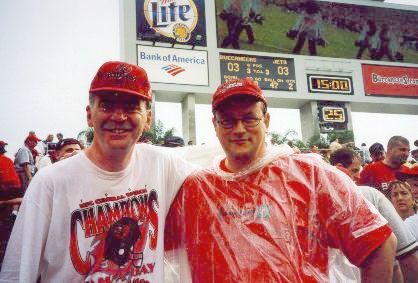 I have been so lucky to attend 2 more live games: In 2000 after the ICCF Congress in Daytona Beach George Packers (Sorry: Pyrich) and I drove to Tampa to see the Jets@Buccanners - and last year Andy was so kind to invite me to London for the Dolphins@Giants game at Wembley! And we are going again this year!! 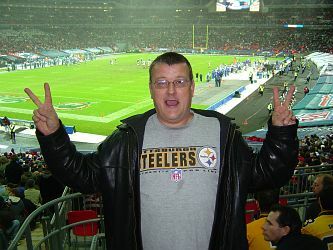 Favourite team: Pittsburgh Steelers - only dissapointment: They have NO Cheerleaders!! 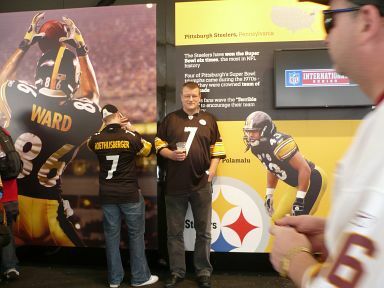 Favourite player (non-US): Morten Andersen - recold holder in the NFL - most scored points in history!! Favourite position: Nose tackle - but I have actually never held a football in my hands!! Wish for Christmas: That NFL will relocate the Baltimore Ravens back to Cleveland - so we can beat the Browns 4 times a year!! Ben - the big no 7: 1st round draft choise in 2004 and plays QB as I play chess! Excellent athlete, strong arm, great escaping trouble by running away - and has a burger named after him!! Make this on any given Sunday: http://www.recipezaar.com/138858. The original burger can be eaten at Peppi's, 927 Western Ave, Pittsburgh - of course the prize is 7 USD!! 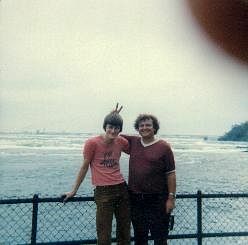 My Steeler Buddy Gene and me at Niagara Falls, 1978. 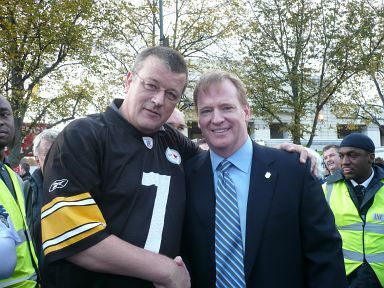 Some years after my visit in "the Burgh" we lost contact - but 10 years ago, I tracked him down at the Internet! Since that day we have played friendly games at goldtoken.com. This is what ICCF really can give us - if we grab the chance - lifetime friendships!